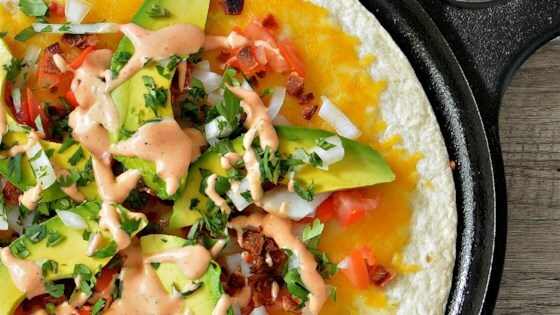 "A quick and easy recipe with bacon, tomatoes, and avocados. A great base to add a variety of toppings and get the kids involved in the kitchen. We love making these for lunch and as appetizers with whatever leftovers we have available; chicken, steak, vegetables. Enjoy!" Preheat oven to 375 degrees F (190 degrees C). Spray a large cast iron skillet with cooking spray. Place prepared skillet over medium heat for 30 seconds. Add 1 flour tortilla and cook until bottom is browned and hardened, about 1 minute. Top tortilla with 1/2 of the Cheddar cheese, 1/2 of the tomato, 1/2 of the onion, and 1/2 of the bacon; season with salt and pepper. Cook until cheese starts to melt, about 1 minute. Transfer skillet to preheated oven and cook until cheese is completely melted, 2 to 3 minutes. Top tortilla with 1/2 of the avocado slices, cilantro, salt, and pepper. Drizzle ranch dressing and buffalo ranch dressing in a zig-zag motion over the top. Can also use a baking sheet instead of cast iron skillet. I prefer a crispy tortilla and would bake it for 2 minutes without the toppings. To make buffalo ranch dressing add 1/4 cup favorite hot sauce to 1/2 cup favorite ranch dressing and mix. Premade buffalo ranch dressing is available too. Easy to make 5 star recipe whether you use it as a meal or an appetizer. I used all buffalo ranch, a mixture of Sriracha and Ranch dressing. Use a pizza cutter to make slices.